We didn't have a whole lot to do today, but I did have my only panel that wasn't a Business Meeting or a Game Show: "How the Hugo Awards Work" with Ben Yalow and David Levine at 1 PM. 50 minutes wasn't nearly enough time to cover the ground we wanted to cover, but we did what we could. At 2 PM I attended the feedback session, which was mostly positive. 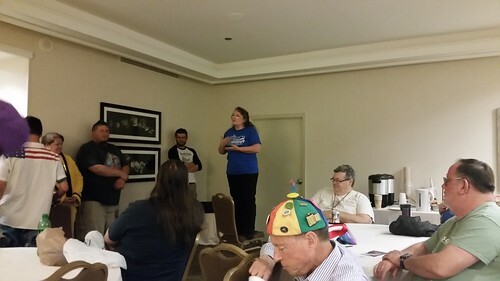 I thanked Westercon 69 for dedicating an immense amount of programming "resources" to Match Game SF. They gave us 12 program room-hours, only about half of which were actually with other members in them; the rest was set-up. But we got a good show out of it that people were coming up to me today saying how much they enjoyed it. It looks like, subject to us be able to swing the logistics, that the next two Westercons (Tempe and Denver) want us to bring the show on the road to them as well. Then it was time to bring the convention to an official end. 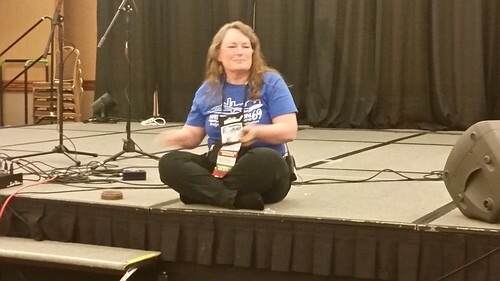 Shortly after 3 PM, Westercon 69 Chair Lea Rush gave brief remarks about the convention, announced Award results, and officially ended the convention. My camera wasn't really fast enough to catch her bringing the gavel down on Westercon 69. 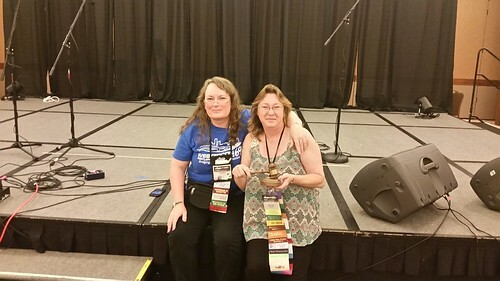 Lea then called up Dee Astell, the Chair of Westercon 70, and handed the Gavel of Westercon over to her successor. With that, Westercon 69 officially ended. We were lucky enough to get our well-placed parking space back when we returned to the hotel. 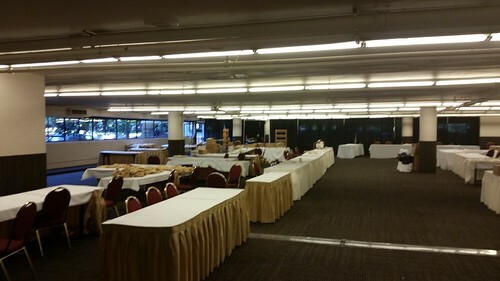 The Dealers' Room, located in the hotel's exhibit hall (a converted section of the parking garage) was mostly moved out, but David W. Clark was still breaking down the Cargo Cult Books table, and we helped him move out. Fortunately, Dave had sold enough books that he didn't have to ask us to transport a box or two back to California for him. The Dead Dog Party could not start until move-out was complete, so we pitched in and helped move equipment down from the Con Suite and from the ground floor staging area (the Halsey Room) to the rental truck. Although Westercon had been plagued by a dearth of volunteers, in this case it looked to me like lots of people pitched in and moved boxes and equipment to help load the truck. Around 10 PM, Lea Rush thanked those of us who had stayed and helped, and the Dead Dog Party was officially started. Many of us went out on the Con Suite's balconies, from which our 15th-floor view gave us excellent views of many fireworks displays in the area. Lisa and I hung around the Dead Dog Party until 11:30 PM, when we headed back to the hotel room. Lisa got the idea that we should move one cart-load of gear down to the van tonight, so I fetched a cart and we moved a load. There's still another load to go that we can't move out until the morning when we're ready to go. We won't get much sleep tonight. We have a lot of things we want to do between Portland and Klamath Falls, and not many hours to get them done. Unfortunately, I can't take another day off from work; otherwise, we'd take three days driving home instead of two.